Boeing employees in Renton, Washington, have started to assemble the wings for the first 737 Max test airplane on schedule, marking the start of production of the company’s latest family of narrowbody airliners. 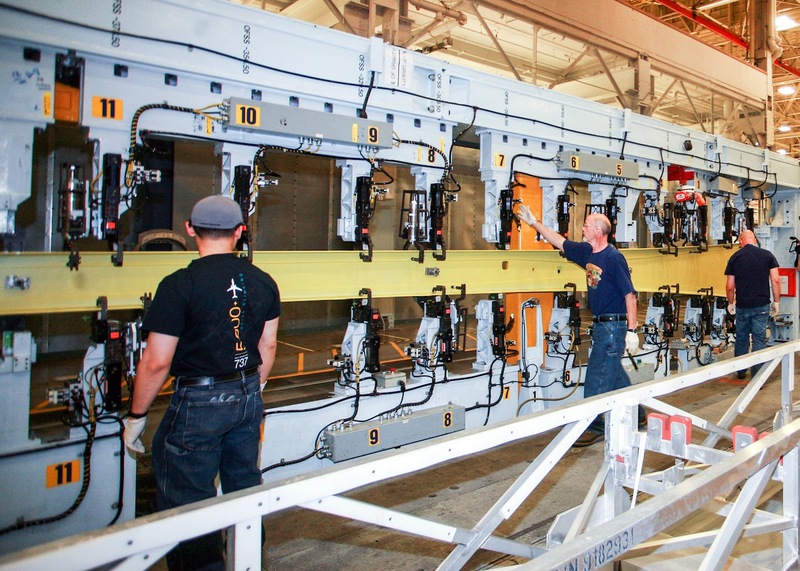 Machine operators loaded 737 Max wing skin panels and stringers into the new panel assembly line (PAL) that uses automation to drill holes and install fasteners in the upper and lower wing panels. The PAL replaces a “legacy” system for skin-to-stringer fastening in which mechanics install some 40,000 fasteners a day, about half of which get done manually. Boeing estimates the PAL will cut flow time by 33 percent, defects by 66 percent, factory “footprint” by 50 percent and injuries by 50 percent. Mechanics have also loaded the initial parts of the first 737 Max spars—internal support structures in wings—into automated spar assembly machines. Boeing Fabrication Skin and Spar in Auburn and Fredrickson, Washington, machined the unfinished skins, stringers and spars. When finished, the panels and spars will form completed wings. Plans call for mechanics to attach the wings to the first 737 Max fuselage on the new central assembly line in the Renton plant later this year. The new production line will allow the team to isolate assembly of the first 737 Max from the rest of production to help it learn and perfect the new build process while the Renton factory continues to turn out airplanes at rate of 42 a month. Since last year Boeing has restructured the factory floor in Renton yet again and installed the wing-to-body join tool that the two current production lines use, ensuring its production readiness by the time the company loads the Max. Meanwhile, the company has consolidated fuselage systems installation (SI) from two parts, each serving one assembly line, into a single new three-level, moving design tool, allowing the company to more efficiently use the available cubic space in Renton. “You can put the fuselage in one section of the tool and it will move in a pulsing fashion, much like our moving lines do, but they will pulse, so that the work moves to the mechanic rather than the mechanic continuing to move to the product in our old [process],” said Boeing’s director of Renton factory operations, Marty Chamberlain. Boeing has commissioned two-thirds of the SI tool, where fuselages occupy six of what will become nine positions, and three sets of three airplanes feeding three production lines. Chamberlain said it takes roughly four days for a fuselage to run through the systems installation tool, immediately before it proceeds to wing-to-body join, gets its landing gear and then down the assembly line. He said the company expects to fully commission the tool by the end of this quarter. Boeing has set an efficiency improvement target for the Max 8—the first of four Max family members--of 14 percent over the 737-800NG, and 8 percent per seat over the A320neo. Schedules call for factory rollout in the fourth quarter, first flight in the first quarter of next year and delivery in the third quarter of 2017. The program has drawn firm orders for 2,720 copies from 57 customers worldwide.